Solar Fountain Sunspray SE 360 ® for Small Ponds and Containers. Our Best Selling Fountain Powered by Solar with Battery Backup. Buy Now FREE UK Delivery. You can use the Sunspray 360 with an existing Bird Bath, Container or Garden Pot of Your choice, to create a magical relaxing Fountain Spray Water Feature. In Less than 10 minutes. The fountain is high quality has a 2 watt solar panel, and a high quality pump which enables you to adjust the flow rate, this allows you to fit the flow to the container of your choice. The SE 360 is also suitable for a range of containers and small to medium ponds, the kit comes with a float system, for easy fitting in deep water, you simply attach the float to the pump and the pump floats on the surface. We do not strain our pumps too highly so you may see fountains claiming a larger height, but these pumps will need replacing, our pumps are designed to cruise and therefore they last a lot longer than the cheaper variety! The panel is high efficiency amorphous silicone which is designed to give much better performance in slightly cloudy / shadier areas, so if your location has some dappled shade then this is the unit to go for. The unit comes with a rechargeable battery pack, the solar panel pushed power in to the battery, then this power is used to run the fountain, the battery comes with an on/off switch so that you can turn the unit off and save up the power, then use this power when you need to. You can choose to leave the unit on and it will manage itself by running with a power reserve, this ensures that when there is cloud cover the fountain will still operate as it then switches to the reserve power. This way the fountain runs continuously and smoothly throughout the day. We believe that this unique product is the best value solar fountain with battery backup as standard in the UK! Excellent 5* service from a great business. I emailed Nath with a question about the fountain and he responded quickly and helpfully. The fountain is excellent and easy to set up (I followed their very good YouTube video) . The battery backup means that the pump works well into the evening after the sun has set. I am thrilled and would not hesitate to buy from this business again. i bought this item when it was on special offer. at that time i didn't have a pond! however once hole was dug and plastic liner was full of water this item was set up and working. last august 2016 whilst on holiday i had an accident and was in hospital and respite care till 23 oct 2017. on returning home pond and fountain invisible due to being covered by long couch grass and various other shrubbery. once all this had been raked away this little fountain was still pumping away, but in raking process i lost the shower head. no prob cos i've ordered a nozzle set for a few pounds from powerbee. all in all - a sturdy little hardworker 5 star. My wife and I were surprise at the quality of this, we have bought some others over the years with varied degrees of success but Powerbee's fountain is different, it does work very well, and the battery back up is a big bonus, as you can save the power, we have a small garden pond and its ideal, and the price is well worth it in my opinion. I am impressed with SE 360 fountain. I must admit that I bought it tongue in cheek as I have had some bad experiences in the past with solar powered fountains. The SE 360 is amazing. Parts of my garden are secluded and therefore do not get the full sun. I have two pools in totally different locations and was so impressed with the first fountain that I ordered a second one for the other pool. These fountains come with a 5m lead so there is plenty of scope for positioning the solar panel. The connectors are "screw" not "push and twist" which makes a positive connection. I have had a fountain with "push and twist" connectors which failed I would suspect that the wire inside had fractured. The battery back up hAS AN ON/OFF switch, my only complaint is that it is difficult to tell if this is on or off, but this is only a minor detail. The product arrived when scheduled. bought this solar fountain to put in my new half barrel as a bigger home for my goldfish who out grew his tank. The fountain arrived very quickly but unfortunately was broken in transit, I emailed PowerBee - they sent me a replacement immediately. Setting the fountain up was very easy - the solar panel is small but it works a treat even on overcast days. The cables are long so that you can position the panel in the best place for sun. I would definitely recommend PowerBee and this fountain and would certainly buy another one. 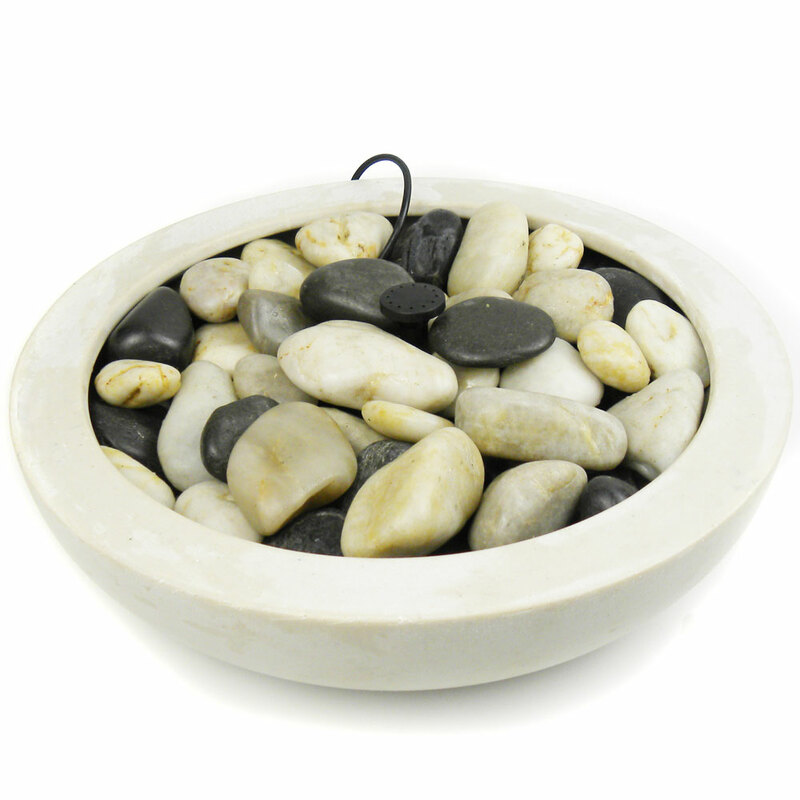 This is a great little fountain for a small pond - really easy to assemble and works straight away. Bought it for my pond to keep the fish happy. The sound of trickling water is lovely, it's a bonus to know that it costs nothing to run. Made the mistake of ordering a similar product from a different solar company and had to send it back( very weak pump and battery would not charge). Placed order with Powerbee,came the next day and hay presto, works like a dream! My husband, Peter, can`t stop looking at it! This fountain seems to be well designed & constructed. It was easy to assemble & worked immediately when switched on. It was delivered very quickly & is excellent value for money. Technology has obviously moved on since I last bought a solar fountain 6 years ago! Connect the "INPUT" cable of the battery back-up to the solar module, tighten the screw for protection. Screw the ground spike tight at the back side of the solar module, insert the solar module at a sunny place, adjust the angle let the solar module facing SOUTH toward mid day sun. Insert the pump plug to the "OUTPUT" socket of the battery backer-up, also tighten the screw. For a floating fountain (deep water), just assemble the nozzle and foam disk to the pump according to the right photo, the nozzles can produce 4 different jet shapes. Turn the switch to the position "ON". The bicolor LED illuminates GREEN. The solar pump is starting to operate. The LED may illuminate RED while it operates at first time, because the battery will lose energy slowly . It just needs to be charged for 2 to 3 hours in the sunlight, then it will change to GREEN and the pump starts to work. When the battery is recharged to its starting voltage, the LED will flash RED-GREEN twice every 10 seconds, this will last approx 30 minutes. Then the pump will automatically operate and the LED illuminates GREEN again. If you want to have long operating time in the evening, then turn the switch to "OFF" position during the day then turn it "ON" whenever you need. Sit back and enjoy your new family member !